So, when my family (whom I described in my earlier post) was visiting last week, I took the opportunity to spring this on them. Splitting into two teams, each has to take turns trying to guess a series of three consecutive words that can be found in the dictionary. (For example: "Sofa", "Soft", "Softball".) The game comes with three separate sets of cards (easy, medium, and hard) with clues leading to the words, and the teams are limited by a timer that keeps the game moving quickly. 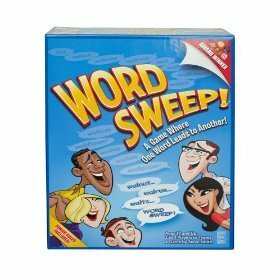 If you enjoy word games, this is one of the few that I've felt will hold up to extended family gameplay over the years. (I would put it in the "timeless" category of Scrabble, Balderdash, Boggle, Taboo, and Scattergories.) Everybody has unique tastes when it comes to game styles, but this is one that we definitely enjoyed! ohmygosh, this sounds SO fun. we most definitely have to play it whenever we get to spend time together.